Sheridan Aleksick describes her experience in the Middle East as “Jumping into Jordan”— a metaphor not only for her photos, but also for the intensive cultural immersion. 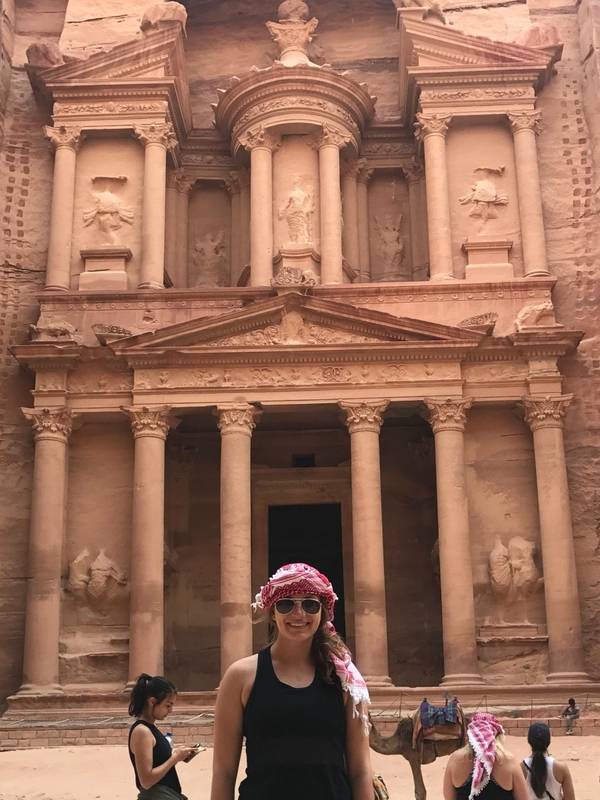 Aleksick, an Army ROTC cadet and Arabic major at the UA, participated in the Arizona in Jordan program this summer as a Boren Scholar, and is staying in Amman to continue her Arabic studies for the fall semester. An initiative of the National Security Education Program, Boren Scholarships are awarded to undergraduate students in the U.S. to help develop a pipeline of foreign language and culture expertise for the federal workforce. Aleksick learned about the opportunity through her ROTC battalion after applying to Project Global Officer, or Project GO, a Department of Defense program that supports intercultural communications skills of future military officers. Named for former U.S. Senator David L. Boren, the Boren Scholarship provides funding for U.S. students to study languages in countries that are typically underrepresented in study abroad. In turn, recipients commit to working in the U.S. federal government for at least one year after graduation. It’s a career trajectory that Aleksick is eager to trace. In addition to her intensive coursework, Aleksick is traveling extensively around Jordan with Project GO, visiting sites such as Petra and the Jordan River Valley. Aleksick plans to continue her ROTC career when she returns to the UA in December and looks forward to what the future holds. The Boren Scholarship Program represents a vital pool of highly motivated students who wish to work in the federal national security arena. In exchange for funding, Boren Scholars commit to working in the federal government for at least one year after graduation. Up to $20,000 is available for a six to 12-month program. Interested students should contact Emily Kotay with the Office of Nationally Competitive Scholarships at emkotay@email.arizona.edu. For all list of all study abroad scholarships offered to students of the UA, visit https://global.arizona.edu/study-abroad/study-abroad-scholarships.